IP Carrier: Are We All Becoming Geeks? Is Technology Adoption Curve Shifting? Are We All Becoming Geeks? Is Technology Adoption Curve Shifting? 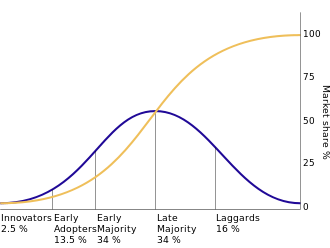 The ways products are adopted usually are depicted as a bell-shaped curve. The notion is that, at first, "geeks and nerds" adopt new technology because they like technology. Only later do people who value the benefits start to adopt. Technology features matter most to the early adopters. Value, ease of use and price matters most to the great majority of adopters. Price matters quite a lot to late adopters. But there are signs the curve might be shifting, with more consumers than before paying attention to technology aspects of the products, some might argue. Instead of the traditional bell curve, there is a sort of "smooshing" in the direction of earlier adoption.